If you've been told that you have a "pinched nerve" what does that mean exactly? Is it dangerous? Will you need surgery? Where in the body may pinched nerves occur? The term pinched nerve refers to a particular type of damage in which a peripheral nerve or set of nerves is compressed as a result of injury or disease. It's important to note that the term "pinched nerve" may be used as a catch-all phrase for injuries resulting from compression, constriction, or stretching, and may not always strictly refer to a nerve which is being compressed. Damage to the nerve may be caused by either inflammation or compression of the nerve and may occur either due to direct damage to the nerve itself or to the protective covering (myelin sheath) which surrounds the nerve. The feeling of your hand or foot "falling asleep"
The pain associated with a pinched nerve can be mild or extremely intense. How Common Are Pinched Nerves? Pinched nerves are very common, with up to 40 percent of people experiencing sciatica (compression of the sciatic nerve in the lower spine) at some time during their life. 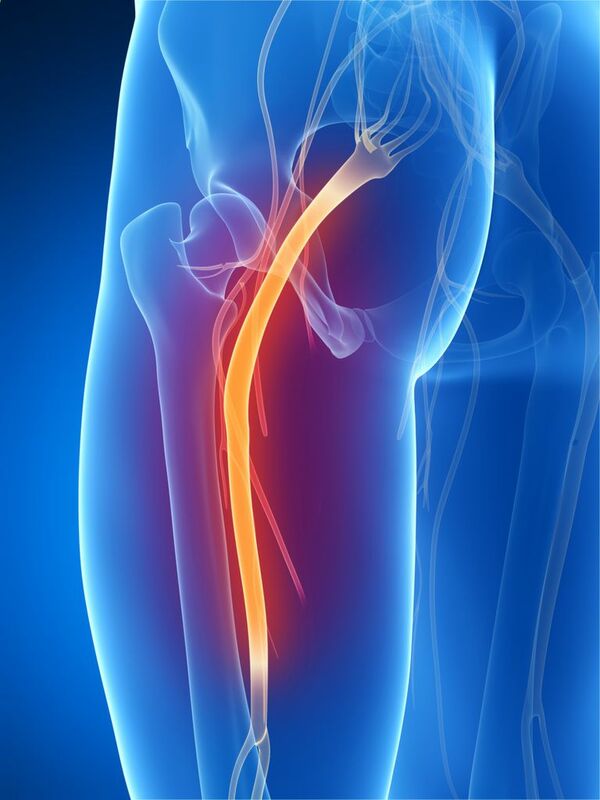 The sciatic nerve is the nerve most likely to be affected by low back pain. In your back and neck, spinal nerves pass from your spinal cord through a small hole (called an intervertebral foramen) in the vertebrae (bones of the back and neck) before traveling to their location in the extremities. The narrow passage of the foramen is a common location for nerve compression to occur. The diagnosis of a pinched nerve begins with a careful history and physical exam. Your doctor will ask you about any medical conditions or injuries which increase the risk of nerve compression and will check your sensation and motor strength in the area where you have symptoms. When a pinched nerve in the spine is suspected, symptoms often occur in a specific area called a dermatome. Electromyography (EMG) and nerve conduction studies are often done to determine whether nerve damage is present as well as to understand the severity of the damage. Ultrasound is an emerging diagnostic tool for evaluating nerve entrapment, especially for nerve entrapment syndromes of the upper extremity such as carpal tunnel syndrome. Tests such as a CT scan or MRI may be ordered to look for causes of a pinched nerve such as degenerative disc disease. Median nerve: This nerve runs along the mid-region of your arm and wrist and affects sensation in your hand. Compression of the median nerve at the wrist may result in carpal tunnel syndrome. Ulnar nerve: The ulnar nerve runs down the outer side (lateral side) your arm past your elbow and affects sensation over the lateral part of your arm (outside part.) The ulnar nerve is what you've likely felt when you hit your "funny bone" in your elbow. Radial nerve: The radial nerve runs down the medial (the thumb side) or your arm and hand. Compression often causes pain on the thumb side of your hand or arm. Femoral nerve: The femoral nerve extends from your hip to your knee and causes pain in this region when pinched. Lateral femoral cutaneous nerve: Compression of the lateral femoral cutaneous nerve (meralgia paresthetica) causes pain along the front and outside of the thigh and may be caused by wearing belts, by pregnancy, or by weight gain. Plantar nerves: Your plantar nerves are located in your feet and often cause a pins and needles sensation in your feet if compressed. Tibial nerve: The tibial nerve runs along your tibia (the largest bone in your lower leg) past your knee and down towards your ankle (past the knee and lower leg.) Compression can cause pain anywhere along its path. Cervical nerves: Compression of the nerves in your upper spinal column (cervical spine) often leads to pain and weakness in an arm. "Winging" of the shoulder blades may also occur. Cervical radiculopathy may also cause headaches or pain deep beneath the breasts. Sciatic nerve: The sciatic nerve is a commonly compressed nerve that exits your spine in your lumbosacral region and travels down the back of the leg causing the pain of sciatica. Rest: In the past, rest for the affected area was often recommended, but there has been some debate over this practice, especially with respect to back pain. That said, for repetitive motion based injuries, such as carpal tunnel syndrome, rest may be all that is needed to resolve a pinched nerve with mild cases. Corticosteroids: Steroids may be used orally, or more often by injection (epidural steroid injections in the neck or back) to reduce inflammation around a compressed nerve. Pain medication: Non-steroidal anti-inflammatory medications (such as Advil or ibuprofen) are often used for pain. When pain is severe, narcotics are sometimes used for the short-term management of pain. Physical therapy: Physical therapy is often used as an initial treatment along with pain management for nerve compression. Medical devices/splints: Splints may be used to reduce motion (and decrease inflammation) around the nerve. Traction: Cervical traction may be used for a compressed cervical nerve in order to open up space where the nerves exit the spinal cord. Alternative/complementary treatments: Therapies such as acupuncture or massage therapy may be helpful for some people in controlling the pain associated with a pinched nerve. A TENS unit may also help reduce pain. These therapies are used primarily to reduce pain and do not appear to have a significant role in reducing nerve compression on their own. Surgery: Surgery may be needed either to remove scar tissue which has led to nerve compression, or resolve the source of nerve compression such as a herniated disc, fracture, or other problem. There are a number of complications which may occur when a nerve is severely compressed either acutely (as in an accident) or chronically (due to degenerative changes or disease.) For this reason, it's important to see your doctor as soon as possible if you suspect you have a pinched nerve. A pinched nerve often causes temporary pain, sensory changes, or weakness, but these may become permanent if the nerve compression is not addressed. Pinched nerves may also lead, in time, to peripheral neuropathy. A pinched nerve can vary from a minor and temporary inconvenience to permanent sensory damage or weakness. Early diagnosis and treatment is important to reduce the likelihood that damage will be permanent or lead to other complications. The term "pinched nerve" is usually used to describe a nerve or set of nerves which are being compressed due to injury or disease. The term, however, is sometimes used casually as a catch-all phrase to describe pain in a particular location even if a nerve is not involved. Symptoms of a pinched nerve differ from a normal muscle strain in that you may feel numbness, pins and needles, radiation of the pain, and more. The specific treatment for a pinched nerve will depend on many factors. In some cases, surgery is needed to prevent long-term complications. Arnold, W., and B. Elsheikh. Entrapment Neuropathies. Neurology Clinics. 2013. 31(2):405-24. Ropper. Adams and Victor's Principles of Neurology, 10e. N.p. : McGraw-Hill, 2014. Print.